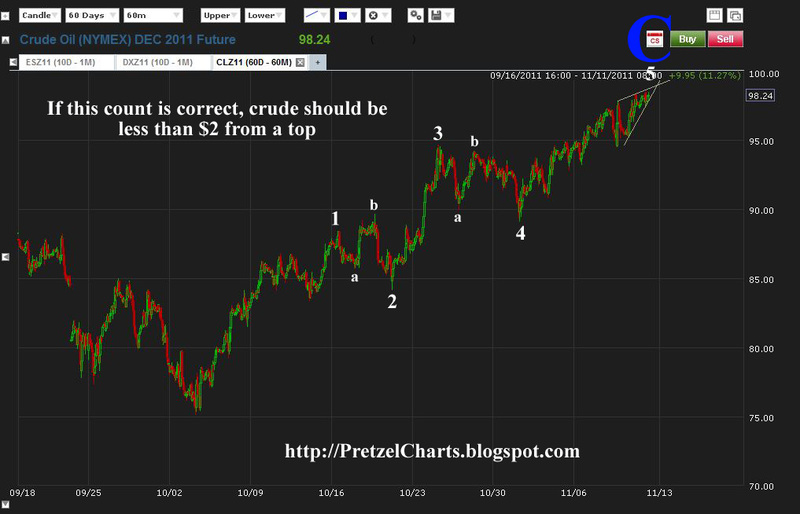 Pretzel Logic's Market Charts and Analysis: (Quick) Crude Oil Update: Top in Sight? 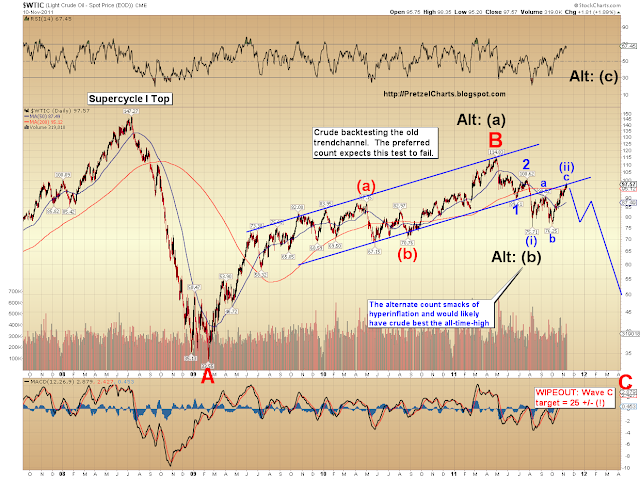 (Quick) Crude Oil Update: Top in Sight? NOTE: Friday's regular stock market update is posted just below. I was just expanding my crude oil charting, and it looks as though crude may be within a couple dollars of the Wave C of (ii) top. This is, of course, assuming my preferred count is correct. If my count is correct, crude may be putting in a significant top either today or Monday. If it exceeds the $100.62 mark, my ST count is off. My confidence in this count is reasonably high. The big picture chart is posted below. Under my preferred count, crude is in the process of completing wave c of (ii), and will soon reverse hard from these levels. The long-term target is $25 +/-. Morning Pretz. An LT target of $25 for crude? Wow. Certainly fits with my thesis that the world has overpriced pretty much everything the past twenty years or so. Are you of the general belief (meaning do the charts indicate) that commodities and materials will crash equally as much as asset pricing? For the 'great recession' (so far) commodity prices have not fallen nearly as much as real estate a securities. Your work on the U.S. dollar, copper, and oil recently is excellent. Are you considering similar wave analysis for gold and silver? That's not unexpected. If you consider the prior crash, equities started their bear in '07, yet (look at the above chart) crude kept rallying until summer '08. Arnie, interesting; his targets align well with mine. Brian, whoops, what I meant to say was if commodities keep rallying for a bit yet, THAT's not unexpected... started my sentence mid-thought apparently, lol. pretz, isn't irt great to get 3rd party independent confirmation? in my line of work that argues for being right! can't wait to fill up my car for a buck fifty per gallon or so!!! I agree oil appears to be topping here. Let's recall the last time oil put in a significant top was on 5/2. The same day the SPX put in its 'historic top'. Daneric says a downturn in oil may precede a downturn in equities. I disagree based off the May pattern. Anyone's thoughts? wave may against Elliott wave rules, please consider the possible extended wave 5 in your wave count. Thanks! I saw someone else consider this possibility, but he did not mention the upside target? In fact, I think it was a link somewhere in the last post (Shanghai Composite). He said if we were a student of his we could figure it out. I'm new at this...do you know the upside target at this count? In my view, it should be done logarithmically. Wave 3 represents a 12.4% advance. So wave 5 would not be longer than wave 3 unless it tops 100.23 (wave 5 low of 89.17 * 112.4%). But either way, an extended fifth is certainly a reasonable interpretation here as well, and I have definitely considered it. TY for your input, and welcome! Oil seems to be trading in a similar fashion to a currency lately... it appears to be everyone's version of the ultimate QE3 inflation hedge. Since August '08, crude has traded in near-perfect lockstep with equities, so I think it's important to watch for clues. I doubt it will lead or follow significantly, they seem to be trading together -- sometimes crude leads, sometimes equities lead.